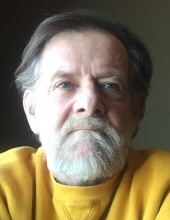 Randall L. Watermolen, “Redeye” walked on peacefully at sunrise Sunday morning, November 18, 2018 at the Wisconsin Veterans Home in King, Wisconsin. Redeye was born April 25, 1950 to Clayton and LaVerne (VanEss) Haum. After Clayton passed away, LaVerne married Kenneth Watermolen who adopted Redeye and his three brothers. Redeye was a 1968 graduate of Premontre High School. In 1968, he enlisted in the Marine Corps and served two tours in Vietnam. He was honorably discharged in 1974. While on leave between his two tours, Redeye’s unit was overcome and lost. He has carried the scars of that war throughout his life. Robert Brown married Redeye and Susan Daniels at a traditional ceremony at their home in August 2000. Redeye carried his responsibilities seriously. First as the oldest of nine children, then as a loyal and honorable Marine, and finally as a warrior watching over, protecting and providing for his family, friends and those in need. He never turned anyone away who needed help or council. Redeye is survived by his wife, Susan; brothers and sister James (Ann)Watermolen of Green Bay, John Watermolen of Hortonville, Douglas (Diane) Watermolen of Whiting Maine; Paul Watermolen of Little Suamico; Joseph (Mary) Watermolen of Green Bay, Mary (Patrick) McNamara of Green Bay, and sisters-in-law, Linda Watermolen of DePere and Sherry Watermolen of Mountain. Redeye is further survived by his daughters, Monica and her children; Niko (Kalonji) Daniels, and Eva Christjohn. He leaves behind his granddaughters, Nakita (Trebor) Tepolt and their children Atikan and Leolene, Iesha (Tommy) Daniels and daughter Jamesha, Yewanakayu Brooks and her son, Myles; Yen^stahawise (Alex) Schroeder and their soon to be baby; and Genevieve Susan Moore, along with several nieces and nephews. Redeye is also survived by his beloved family at the Wisconsin Veterans Home, as well as his extended family and friends. Redeye was preceded in death by his parents, LaVerne, Clayton and Kenneth; his brothers Rick and Bill, his grandparents Harry and Margaret VanEss and George and Madeline Haum, and his daughter Rachel. Family and friends may call at Ryan Funeral Home, 305 North Tenth Street, DePere, Wisconsin from 4:00 p.m. to 7:00 p.m. on Friday, November 23, 2018. A sharing of stories will close the evening at 7:00 p.m. Visitation will continue Saturday morning, November 24, 2018 at 9:00 a.m. until the time of service at 10:00 a.m. Burial will follow at the Oneida Sacred Burial Grounds. To send flowers or a remembrance gift to the family of Randall "Redeye" Watermolen, please visit our Tribute Store. Sharing of stories at 7:00 PM. Service at 10:00 AM. Military Honors to follow. "Email Address" would like to share the life celebration of Randall "Redeye" Watermolen. Click on the "link" to go to share a favorite memory or leave a condolence message for the family.